CapGemini have come out with their World Payments Report – 2009 [pdf 60 pages]. Lots of statistics, but the one that leapt out at me is this. Japan stands out as a growth leader, despite being a mature economy. Certainly their growth potential is large given the traditional consumer cash economy, but I have to look at the North American lowly 5% and wonder that lack of innovation in payments is not a driver. Certainly there remains lots of cash transactions to convert to payments but nominal innovation in the works to migrate to electronic. The report notes that cash in circulation continues to growth in the Eurozone. 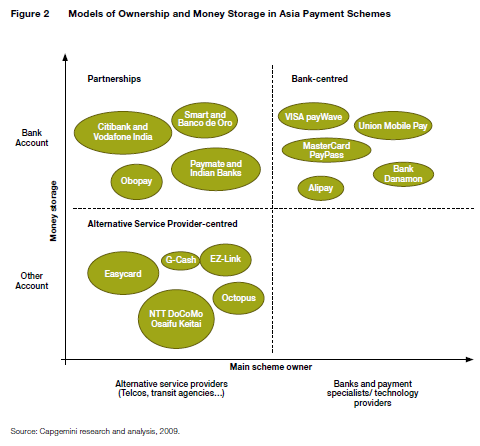 There is an interesting section reviewing the payments innovation in Asia, and a chapter devoted to summarising the state of SEPA.